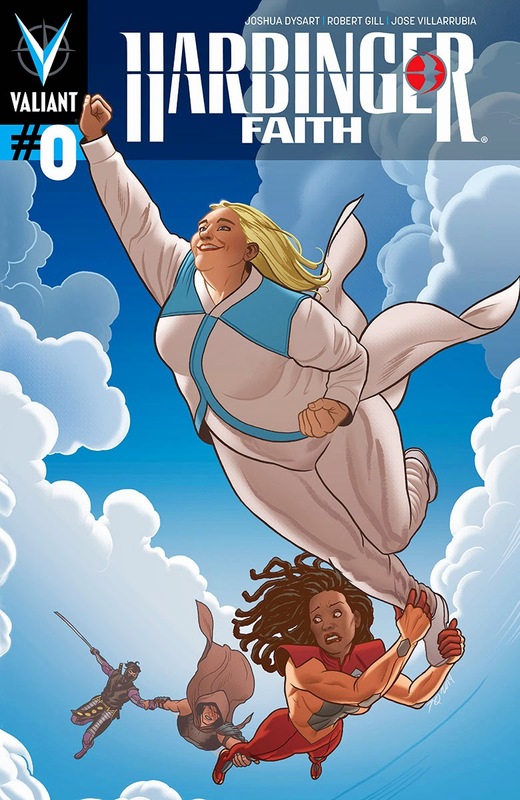 The Fellowship was fortunate enough to obtain a copy of HARBINGER: FAITH #0 from Valiant Entertainment. The story is by Joshua Dysart, with art by Robert Gill, colors by Jose Villarrubia, and lettering by Dave Sharpe. Faith is literally flying high after their recent adventures; especially with the battle with the Armor Hunters’ insects in Mexico City. Torque is more interested in the fame and would rather capitalize on it. Unfortunately, Faith is less than enthused with the trappings that her boyfriend is fallen for. When the opportunity of a lifetime is offered to her, will she leave her only boyfriend to do the thing she loves more…being a superhero? It’s real hard not to like Faith; she is a character anybody can look up to. She’s not the traditional looking hero, but she wants to be one… for all the right reasons. I’m so happy she is joining Unity because she can be a great asset for the team. Joshua Dysart and Robert Gill paint a picture of a modern hero with the classic ideals. Pick this book up now! HARBINGER: FAITH #0 is in stores now, or available for ordering at valiantuniverse.com.